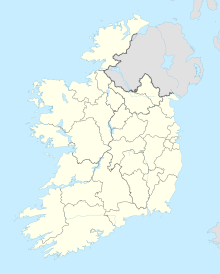 Bodenstown Graveyard (Irish: Reilig Bhaile Uí Bhuadáin) is a cemetery located in County Kildare, Republic of Ireland. Containing a ruined medieval church, it is best known as the burial place of the Irish patriot Wolfe Tone (1763–1798). The stone church dates to before 1352, in which year it belonged to Great Connell Priory, and measures 12 m (39 ft) by 7 m (23 ft). It was described as being in good condition in 1612 but was ruined by the 19th century; all that remains are the west gable and north and south walls. Tone was buried next to his father at Bodenstown following his execution in 1798. Semi-official commemorations are believed to have begun in the 1840s. In "Tone's Grave", Thomas Davis describes his visit there c. 1843. Pilgrimages to Wolfe Tone's graveside were first held in 1873, the 75th anniversary of his death. After gaps in the 1880s, they resumed in 1891, and have been held every year since, except in 1906–10 and 1921. The ceremony, involving a march from Sallins railway station to the graveyard, took place on the Sunday closest to Tone's birthday, June 20th. Since 1922 there have been rival parades on different June Sundays due to schisms within Irish republicanism. The tomb was restored in 1971. There is one British Commonwealth war grave of the First World War, of Private Walter Duffy of the Leinster Regiment, who died on 7 July 1918. ^ "Bodenstown Churchyard Cemetery - County Kildare, Ireland". www.interment.net. ^ "Grave of Wolfe Tone - County Songs". ^ Castlehunter (18 May 2017). "Ireland In Ruins: Old Bodenstown Church Co Kildare". ^ edmooneyphotography (10 September 2013). "Bodenstown Church & Cemetry". ^ "Annual Wolfetone Commemoration in Bodenstown! - Indymedia Ireland". www.indymedia.ie. ^ "Pilgrimages to Tone's grave at Bodenstown, 1873–1922: time, place, popularity". 27 April 2015. ^ "PROCESSIONS TO REMEMBER WOLFE TONE". www.kildare.ie. ^ "Wolfe Tone Commemoration". RTÉ Archives. ^ "UNVEILING AT TONE'S GRAVE". www.kildare.ie. ^ "Bodenstown Old Graveyard, with list of casualties". Commonwealth War Graves Commission. Retrieved 7 February 2019.